Tonight, Joe Mayer, the Cincinnati car salesman who stripped down his diesel 2010 Volkswagen Golf prior to his court-ordered buyback appointment, got a call from VW telling him not to bother bringing it to the dealership. Even after removing the doors, rear hatch, airbags and almost everything else from the car, Mayer hoped to sell it back to VW under the terms of the buyback. Turns out VW isn’t down with his approach to simplifying and adding lightness. 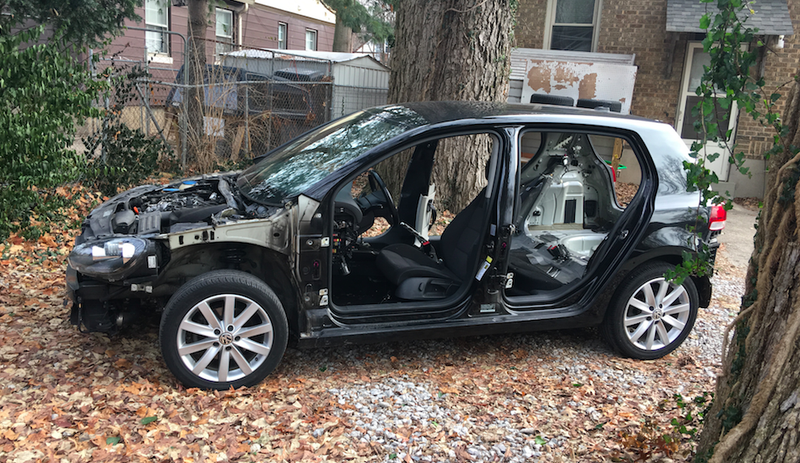 After yesterday’s story about Joe’s stripped VW, many wondered if Volkswagen was going to actually pay for the dismantled (but still running!) husk of a car, or if the company would just turn him away. Joe says his car drives just fine. Joe says the VW rep—whom he believes was heavily coached on what to tell him—did not give a time frame for his new appointment, but simply emailed him an attorney’s number to whom he should direct questions. He thinks the automaker is “just trying to bide some time,” and he expects them to get back to him once they have spoken with their lawyers, a move he fears is meant to find some way or another to get out of having to pay him. Joe remains firm that stripping the car wasn’t a breach of the terms in the class action suit, saying he plans to get his own legal advice in the coming days. As for when or if VW will schedule Joe’s new buyback appointment, we’ll just have to wait and see. For his part, Joe said he followed the claims process to the tee, uploading all of his documents as soon as the claims portal went online in an effort to be first on the buyback list. The car enthusiast and Jalopnik reader fears that Volkswagen might drag this out, like it has with so many other upset VW owners. “I’ve waited long enough already,” he told me tonight. Volkswagen’s priority is to make the 2.0L TDI settlement process as seamless and convenient as possible for our affected customers and we are working hard to ensure that this is the case. The program is governed by specific eligibility guidelines and other conditions which were agreed by all the parties and approved by the Court. Subject to regulatory approval of modifications that will allow vehicles to meet agreed emissions standards, the settlement allows Volkswagen to modify some of the vehicles we buy back so they can be returned to commerce rather than scrapped. The great majority of Volkswagen owners take very good care of their vehicles and are returning them for buyback intact.